In addition to full bar service in the shop, we are happy to also offer beer delivery and package beer sales! to receive beer delivery, please note: you must be 21+ to order beer delivery. All beer sales must be prepaid. You must provide a valid picture ID that matches the name on the credit card to receive beer delivery! If unable to provide valid ID, no beer delivered and no refund thanks! We love making tamales. Our masa is vegan, gluten-free & delicious. Tamales served in rotating flavors everyday until sell out. Thanks! 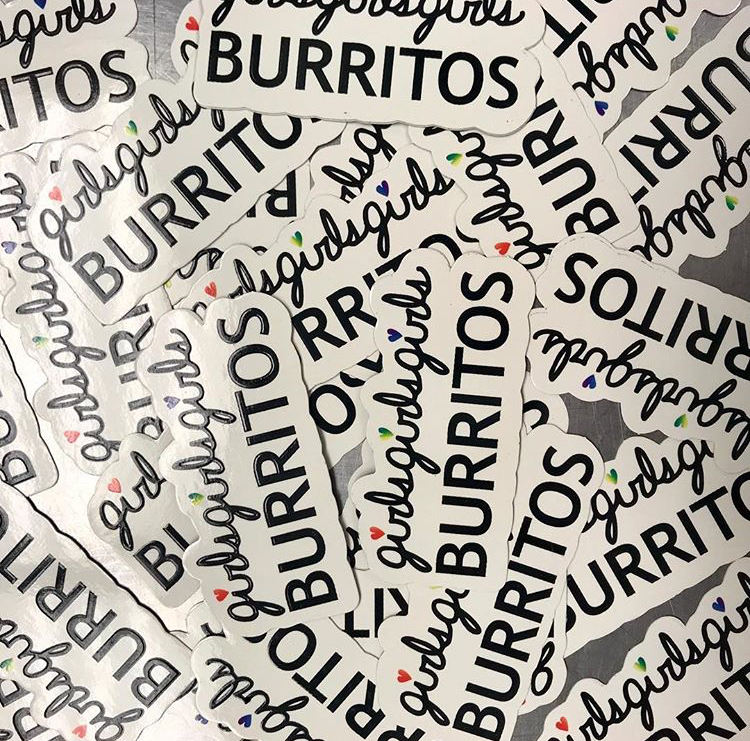 we make our burritos el dorado style: an extra large flour tortilla is filled and rolled to order w/ house-made ingredients, then grilled to a deep golden brown delicious. *for our classic menu items prepared vegan, please see our new 'vegan' menu category! build your own grilled burrito! 4$ each includes your choice hard or soft shell & 3 fillings. Choose fillings below; first three free and each additional filling is plus $.50 each. We are happy and proud to offer a wide array of vegan options. We've separated out our classics here, prepared vegan. You'll also find vegan tamales and other 'build your own' menu items throughout our online menu w/ plenty of vegan options, too. Thanks! a classic grapefruit thirst quencher! we have Jarritos in many flavors! Pick out your flavor at the cooler by the cash register! parking: hi! we currently don't have girls only parking (some takeout spots on the way!) .. meters are free after 5pm and on weekends and holidays! The lot directly behind girls on Jersey Street has easy text to pay parking (cheap!) and is right by our back door entrance marked by the "BURRITOS" window sign! Bicycles welcome in the shop always and there are racks along Limestone, too. apply to work at girls! small or large, we are happy to work with your vibe and budget! Popular girls catering offerings include: taco and nacho bars, fresh tamales, fresh guacamole and queso with our girls' spiced tortilla chips. ** founded, funded, owned & operated by bffs: S.Wood & Wade H., spring 2016. ** Online ordering, Web design & site hosting provided by the Louisville-based & independently-owned MenuPunks LLC since day 1. ** A note on food procurement: We love to eat, too, and are always seeking out the best food from Lexington and surrounding region to feed you top quality and support our rad community! We love creation gardens, the farmers market, local growers and farmers, the super mercado, and our own gardens. We proudly serve eggs from Mr. Tanaka's chicken farm and he takes our used fryer oil to fuel his biodiesel farm activities. What a great guy! *M-F Happy Hour 3-6p --> Bob Ross painting videos! *Late Nite ---> cheap bites and trippy cartoons! *Lunches ---> PopUp Video, nature walks, skate vids, festival vids, and first person biking videos from around the world! 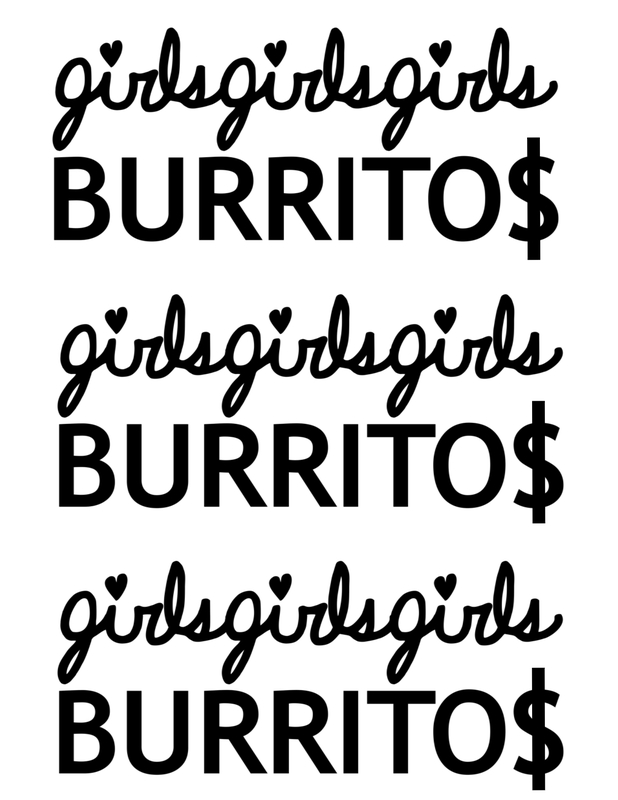 vinyl, all-weather girlsgirlsgirls BURRITOS stickers! * Please prepay online for all gift certificates. * Please include in the 'special instructions' if you would like us to address it to someone specific. * We are happy to mail it for you! Please include name and address in spec. instructions (or note if you'll be by the shop to pick it up). * Gift certs expire one year plus one month from the day of purchase. Minimum 9.00 for BICYCLE DELIVERY. girls is happy to now have a full bar and expanded menu! come say hey at our new bar, happy hour daily, top notch margs, mezcal, & more!